I have always had some kind of bucket list growing up. Not necessarily always written down, but it seems the more I try something outside my comfort zone, the more I want to add something new to my “to do” adventure list. 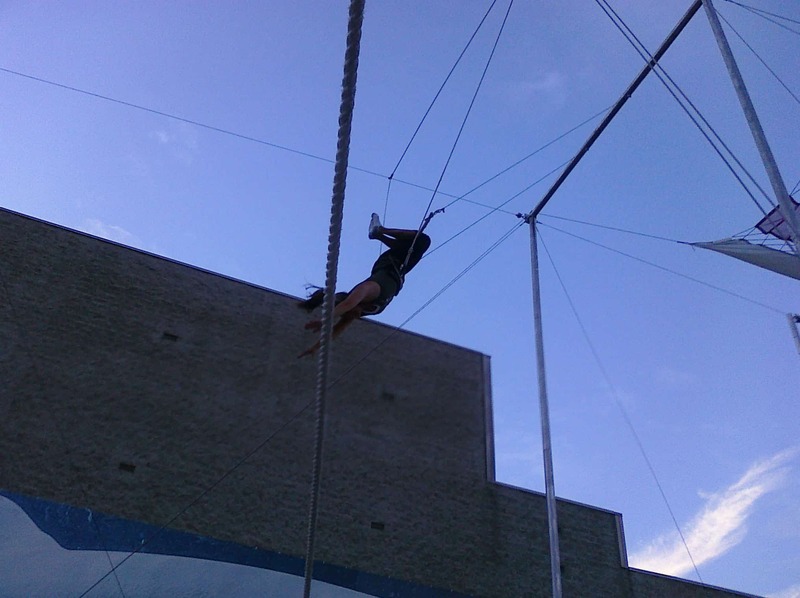 So far, one my favorite bucket list items was trying the trapeze. 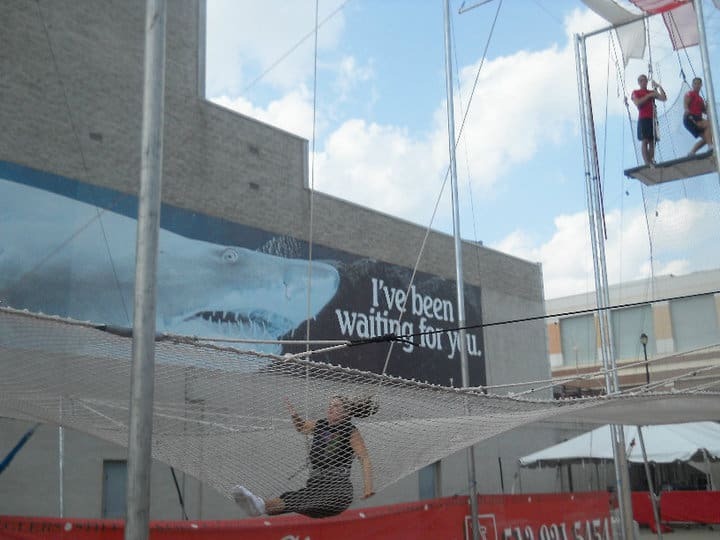 We had noticed a trapeze rig at one of the popular tourist spots in town. After I saw it, I knew I had to try it. Conveniently, a friend of mine and I wanted to do something adventurous for our upcoming birthdays, despite that fact that we were moms. 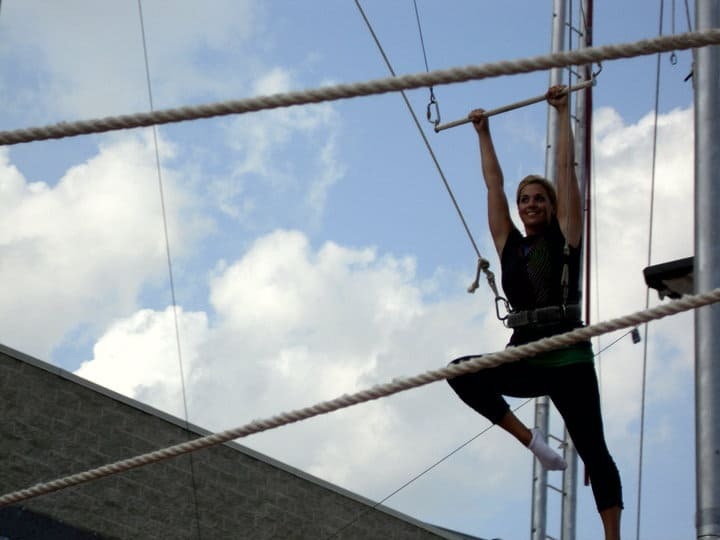 This was the perfect opportunity to live out my 2nd-grade childhood dream of flying on the trapeze. I will totally date myself by sharing this, but I remember watching “circus of the stars” as a child and thinking if a celebrity could learn a circus trick, so could I. 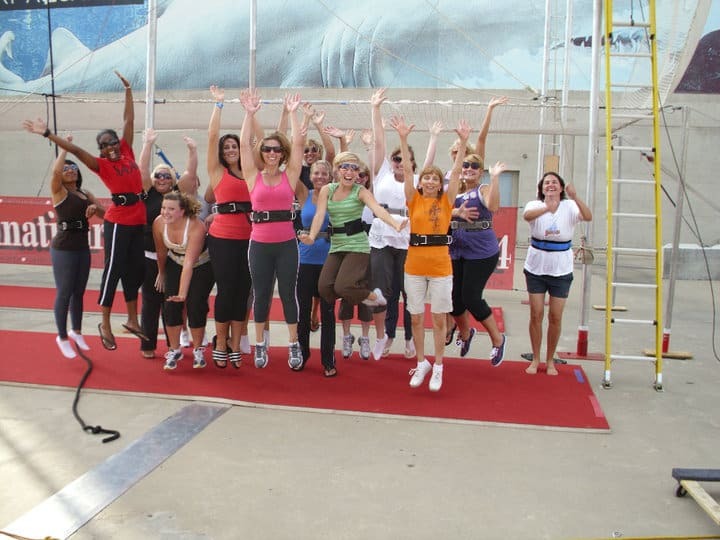 As we researched the cost, we thought it would be even more fun to get a bunch of friends together to take the leap of faith too. Safety in numbers and at least we would know all of the people in our group and get a discount. We were all nervously excited about our big day. We were given the instructions on the ground of how to lean out to hold onto the bar, phrases for when you are ready to start and how to fall. Our spunky friend jumped at the chance to go first. She did great and gave us the confidence that it was doable. I wanted to go next because the longer I waited; the more my stomach was in knots. The worst part was climbing up the ladder. The ladder was secured to the apparatus, but still had a lot of movement on the way up. 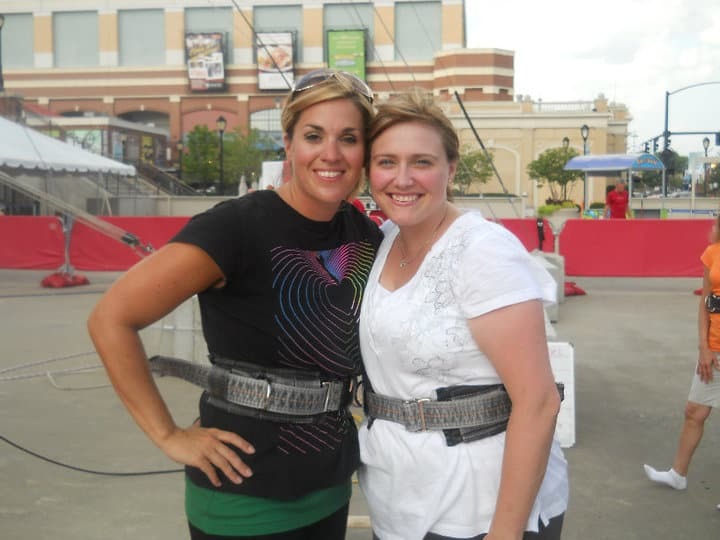 We were also harnessed up for the climb so it was more mental than anything. 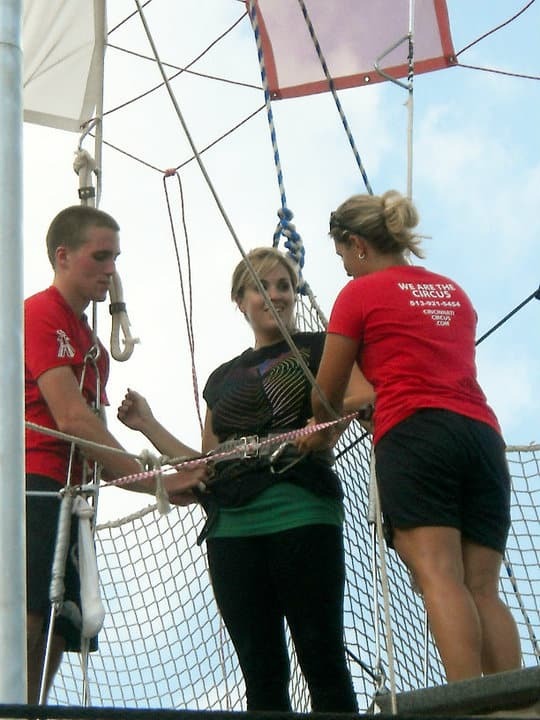 As I got to the top, I was greeted by the instructors who were really encouraging. You have to lean really far out from the platform to reach the bar. It’s a very unnatural feeling because you can feel the tension as you pull the bar closer to you on the platform. I mentally went through what I was about to do in my head before taking the leap off the platform. I wanted to accomplish two things. 2.) Not injure myself while falling into the net. 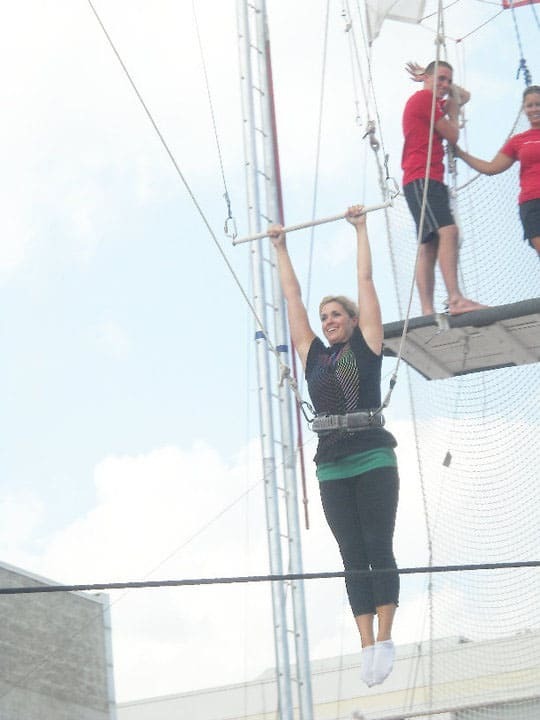 I held on the bar with a death grip and even joked around by posing pretty pointed toe motions. 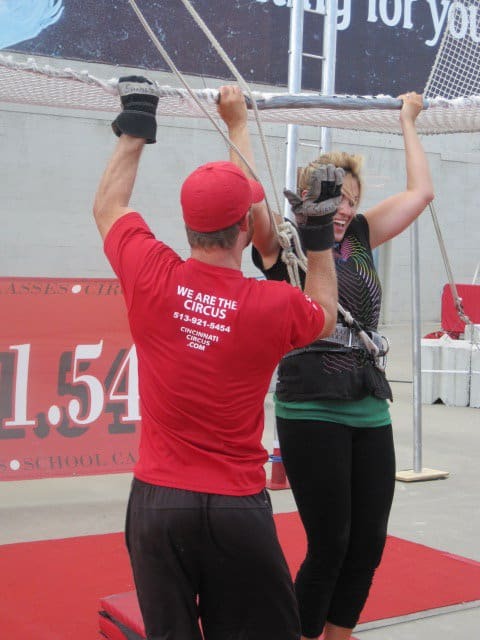 After several swings back and forth, my arms were losing strength, so I had to let go. Another unnatural feeling. 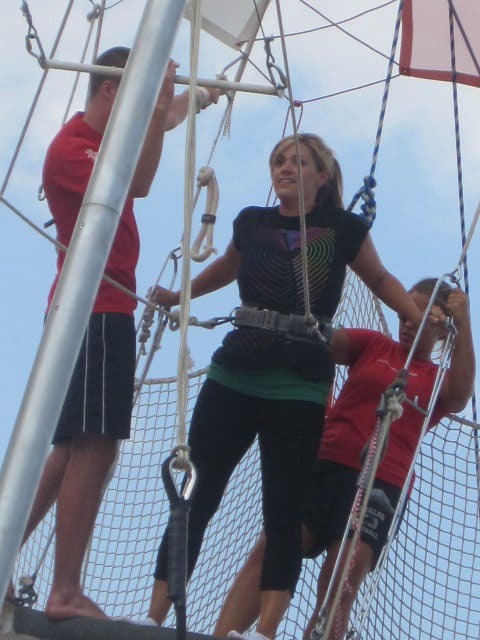 Even though we were tethered to make less of an impact, I still had to let go and fall on my back. That was easier than I anticipated. After that was one of my favorite parts; the cool flip off the net to the ground. For whatever reason, I have always thought that part looked really fun and graceful. 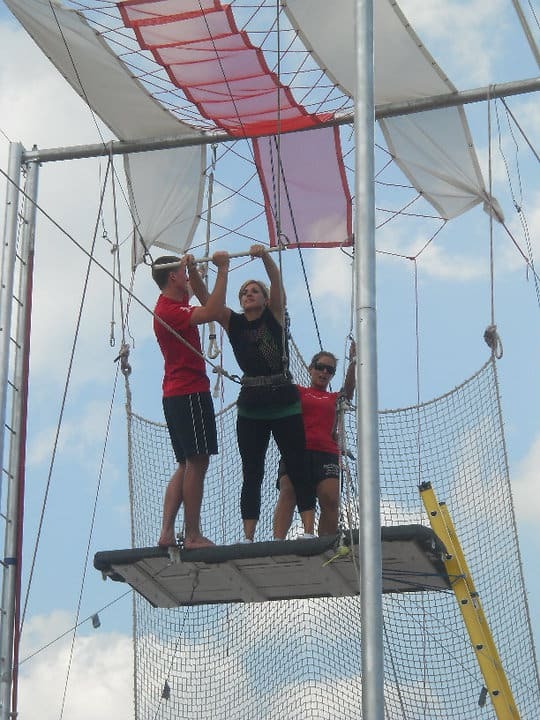 The rest of the group continued to try with several facing their fear of heights and overcoming with great cheers from below. The next round I attempted to kick my legs up to hang upside down. 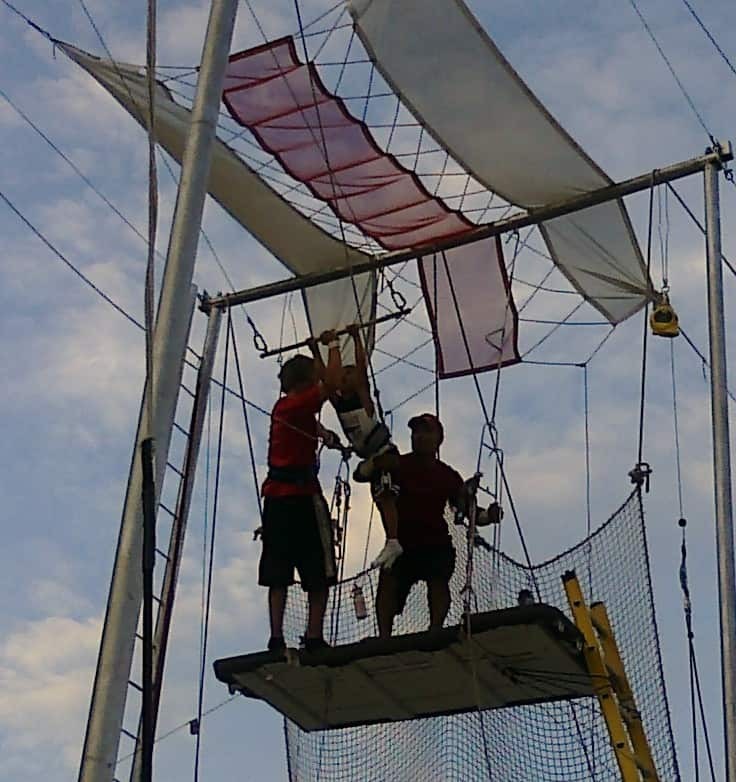 After several attempts, my arms grew tired and the instructors coached me on how to do a backflip as a dismount into the net. That was intimidating to execute but sooo worth it. I never dreamed I would do a back tuck into the net that night. I was fully expecting just to be content with swinging and falling. On the third attempt, I finally pressed thru and got my leg up after several swings back in forth. My arms were tired but I had to do it. The experience was scary and freeing at the same time. The experience took me back to my backyard playground swing set going upside down- just on a bigger scale. After another back tuck dismount, I helped cheer on the rest of my friends. 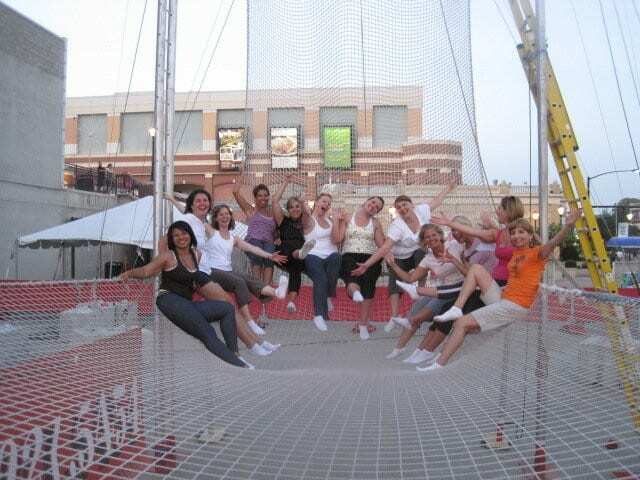 We had enough time to try it 3 times and all of us had a great time. 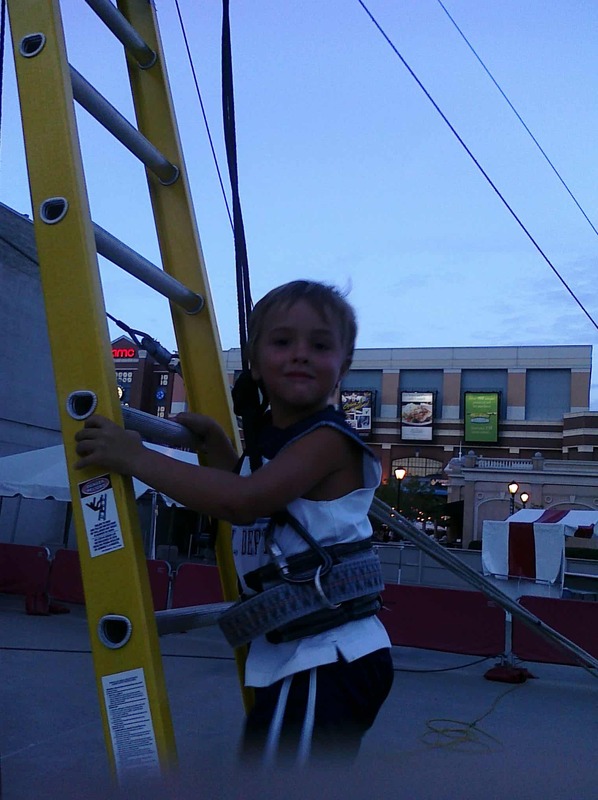 A few weeks later, I found a Groupon to go again and thought this would be such a fun experience for our family to celebrate my older son’s birthday. 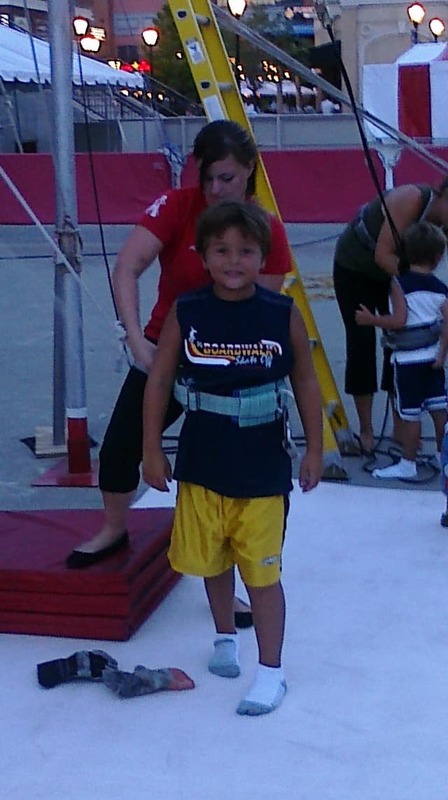 So after we celebrated his birthday poolside with friends, we headed back to the trapeze rig. It’s was comical to watch my husband, who is 6ft 4 inches and of football player stature, be belayed by a tiny female worker. 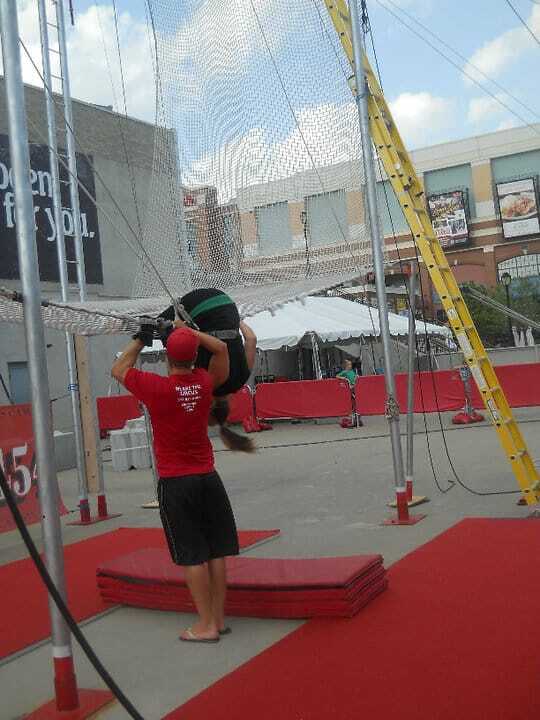 As he fell into the net, we watched her get lifted off the ground while belaying his fall. Both of my boys really liked it. The youngest (4 years old at the time) displaying the least amount of fear. The workers had to lift him to reach the bar. His biggest challenge as he swung was not having a lot of arm strength developed yet. 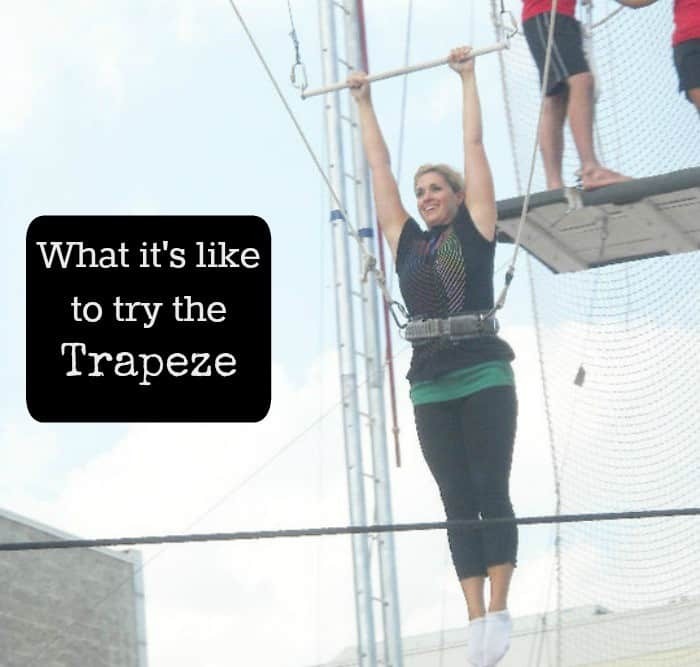 Trapeze is great because it forces you to face your fear, trust the equipment and instructors and LET GO! As a mom, I find it even more important now to continue the quest for fun and adventure even in the simple things, just to feel alive. It’s so easy to get caught up in the daily routine that we forget to enjoy our life along the way. At some point, we have to choose to leave the comfortable and continue to challenge ourselves to stretch and evolve over time. Otherwise, we end up at the end of our lives with a list of things we wish we would have done…and then we realize that the only person standing in our way was ourself. Sometimes we feel we have to hold off on things we want to do until our kids are grown, but I say there is room for both. When I explore something new- either alone, with friends, on a date or with my family, it makes me feel more alive and in turn makes me a better mom. So my encouragement to you is to check out some of my posts and find something that interests you to try. Not every experience appeals to everyone, but I hope this blog encourages you to step out and try something new and start living your dream. 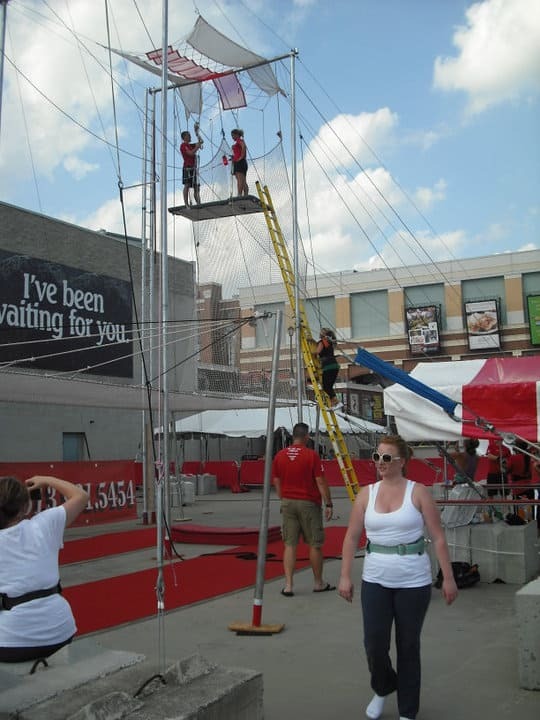 Check out Cincinnati Circus Company website if you have ever wanted to scratch trapeze off your list. TIME TO DREAM AND DO! That was one adventure I probably would never had done if you didn’t invite me. It was such a great time and am super glad I went. Would have been better if I had more abb muscles though :-). Thanks! What a great blog!!! I’m SOOOOOOOO afraide of hights but doing something like this is on my bucket list too!!!! Stopped by from MeloMomma’s Share It Friday hop. 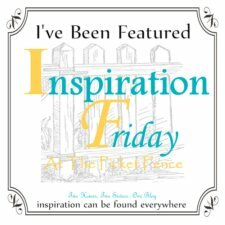 Oh, how inspiring was this post and your entire blog! I loved this, and yes, your flip was quite lovely. You looked like a pro! 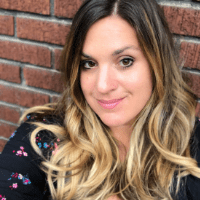 How do I follow your blog? RSS feed? Given the purpose of your blog and several of your posts, we think you’d like See Beautiful too.